It’s a dangerous time to be working in health care. On any given day, health care workers are at risk of getting stabbed, choked, punched, bitten, spat on or verbally abused. According to information obtained by the Toronto Star, the number of reports of violence on hospital staff in the University Health Network (which includes Toronto Western, Toronto General, Toronto Rehab and Princess Margaret Hospital) nearly doubled between 2012 and 2014. Hospital administrators attribute the rise to changes in standards for reporting incidents – something unions that represent health care workers have been fighting hard to improve. But worker advocates say continuing cuts to our health care system, and the ensuing cuts to hospital staff, are also a factor. When there is less staff, the staff that remain become more vulnerable to assault because they might have to work alone and because they have to manage more patients. Nine consecutive years of hospital funding cuts by Ontario’s Liberal government have only added to the already precarious situation health care workers face on the job. In April of this year, an article in the New England Journal of Medicine drew attention to the problem of violence against health care workers in the United States. It found that incidents are under-reported and largely ignored. The authors reviewed previous studies on workplace violence and discovered that in one study in particular, 46 per cent of nurses surveyed had reported workplace violence in their last five shifts – almost half. If this were happening in any other profession, it wouldn’t be tolerated. All health care workers in all health care settings are at risk of becoming victims of violence, but due to the unpredictability of their patients, those most at risk are mental health care workers. One recent study from the University of Melbourne concluded that mental health nursing is the most dangerous profession in the Australian state of Victoria. The study found that mental health nurses were more likely to be assaulted than police officers. It doesn’t take too much digging to see parallels here at home. In December of 2014, a nurse at the Centre for Addiction and Mental Health (CAMH) in Toronto was severely beaten and suffered a serious head injury. A similar beating had occurred at the hospital the year before. Royal Ottawa Health Care Group faced five charges under the Occupational Health and Safety Act relating to the stabbing of a nurse in October 2014 at its Brockville Mental Health Centre division. The nurse was stabbed repeatedly in the throat with a pen, by a patient in the forensic treatment unit. Health care workers in that unit provide care for patients who are found unfit to stand trial or not criminally responsible by the courts, or who are undergoing psychiatric assessments ordered by the court. And just earlier this year, there was a serious violent incident in the forensic unit at Waypoint Centre for Mental Health Care. A worker was stabbed in the back by a patient who had obtained a screwdriver from a job training program within the hospital. Three other workers were also injured in the same attack. The next day, three more workers were hurt in another attack. And just one month later, there was another violent incident that resulted in injuries to three other workers. Workers at Waypoint see this disturbing pattern. Many of them fear they might be next. The OPSEU local representing this group of workers has launched a campaign to raise awareness about safety concerns at Waypoint. Their worries can be summed up in a phrase that is echoed daily in the halls of the forensic unit. “Stay safe, be safe,” is what caregivers at Waypoint say to each other at the beginning of their shifts. This serves as a reminder to everyone to be vigilant. They must always be on guard; they must always be assessing their surroundings – all while providing care to patients who have committed serious crimes. the implementation of safe staffing levels that would prevent scenarios where an employee has to work alone. Dedicated security staff could also help reduce violence in regular hospitals. One example of a facility that currently employs security staff is Michael Garron Hospital – formerly the Toronto East General Hospital. When one staff member who commuted a long distance was asked why she continues to work at the hospital, she replied by saying it was because she felt safe. There is no question the government needs to do more to protect health care workers from workplace violence. Mandatory safety protocols are a good start. After all, these are the people who are there for us when we get sick. If we don’t take care of them, how can we expect them to take care of us? 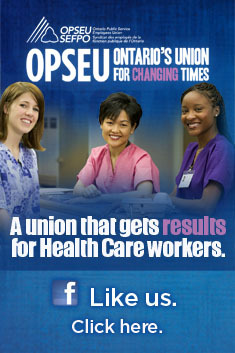 Check out opseu.org/staysafe for more information on how you can get involved.